Are you looking for an inexpensive thrill this evening? Why not take yourself (and your camera), and your pretty manicured nails across London, to imbibe in this year’s Christmas lights? There’s nothing quite like the sparkle of London at this festive time of the year and spot of ice skating or Christmas shopping can only add to your cheer! 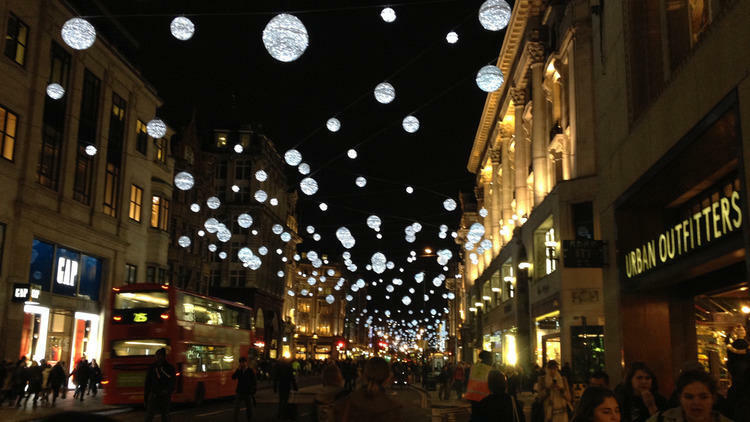 Check out Timeout, for more information on Christmas lighting in London this year but, for a quick outline, read on! Already a glamorous part of the town, Bond Street’s peacock-inspired decorations of last year, with enormous feathers sprayed above festive shop windows, can only be surpassed with this year’s show of illuminations. Covent Garden, renowned for living statues and fire-eaters, cobbled piazza and market buildings are irresistible yesteryear visions for all who imbibe the spirit of the season. 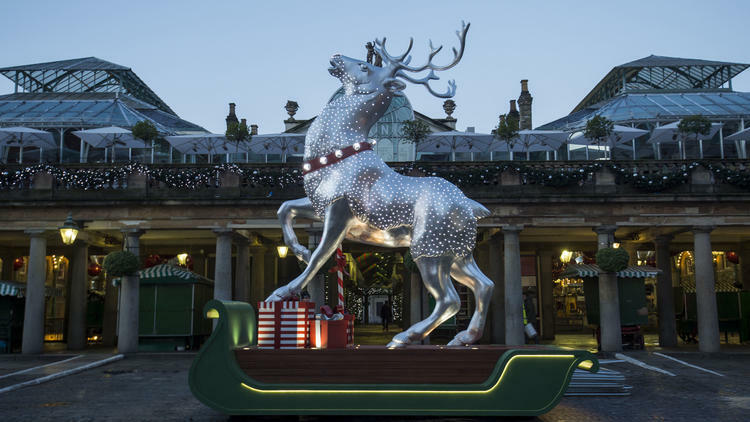 This year’s mistletoe theme, with 50 new lighting arrangements over this pretty-as-a-picture area of historic London, couple the added charm of a glowing red and white lit tree on the west side of the square and majestic silver reindeer, rising above a cascade of gifts on the east side. For added festive cheer, why not take a ride on the Santa Express train, made with 500,000 Lego bricks with lights, sound and smoking chimneys; you can see this happily chugging down the north east corner of the piazza. 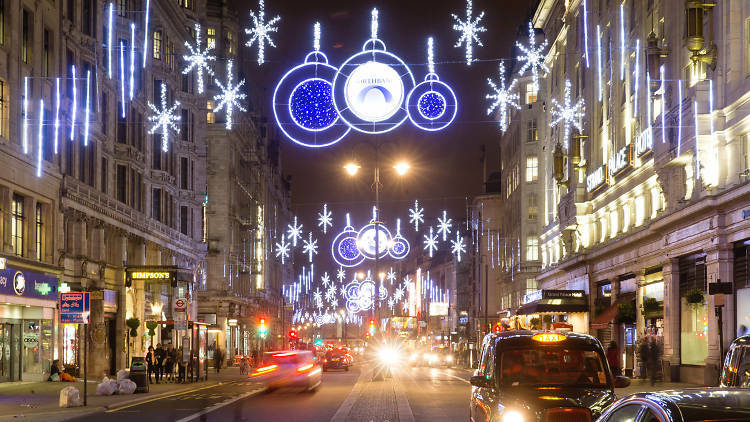 The Strand, the Northbank area of London that was the first to enjoy electric street lighting, together with the Savoy Theatre, the first public building in the world to be lit entirely by electricity, more than 100 years ago, return with yet another spectacular lighting display this year! 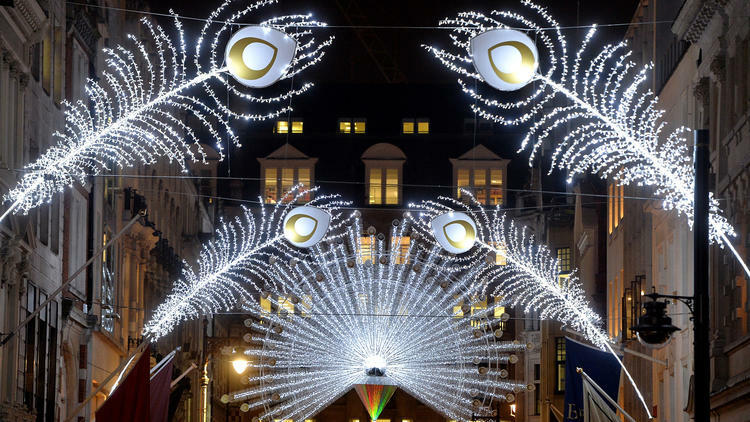 Those sparkly glowing baubles are back for a third year, on Oxford Streets thoroughfare. 1778 snowball-like decorations, with 750,000 LED lightbulbs, light up the street for the fifty-sixth year of decorating London’s most visited shopping arena. A subtle upgrade on last year, with 445 new golden orbs, join the twinkling silver lights to provide the perfect spirit of the season. 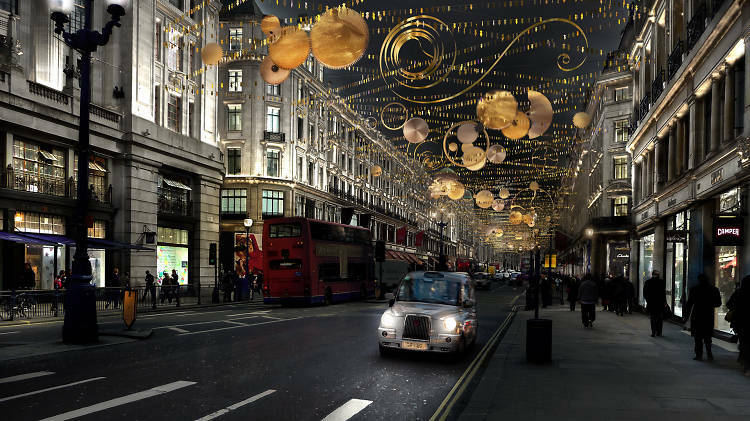 Regent Street Christmas lights are more magnificent than ever this year. Garlands of lights, twinkle down this grand shopping stretch, featuring shimmering golden sequins, cogs and coils, and are all provided by ACT Lighting Design, who also designed Paris’ Christmas lights spectacle, to create olde-world charm for tourists and shoppers alike to enjoy. If you love delicate baubles and twinkling lights of this season, why not treat your nails to some festive glamour: JACAVA London‘s Regent Street and Oxford Street nail polish are 9-free of the known nasty chemicals and offer extra cheer to the holiday season!! Multi-purpose, natural and affordable, coconut oil has exploded onto the scene this year like no other product. It can be used to treat your hair, nourish your skin and nails, whiten your teeth, wash your face, enhance your cooking and smoothies. 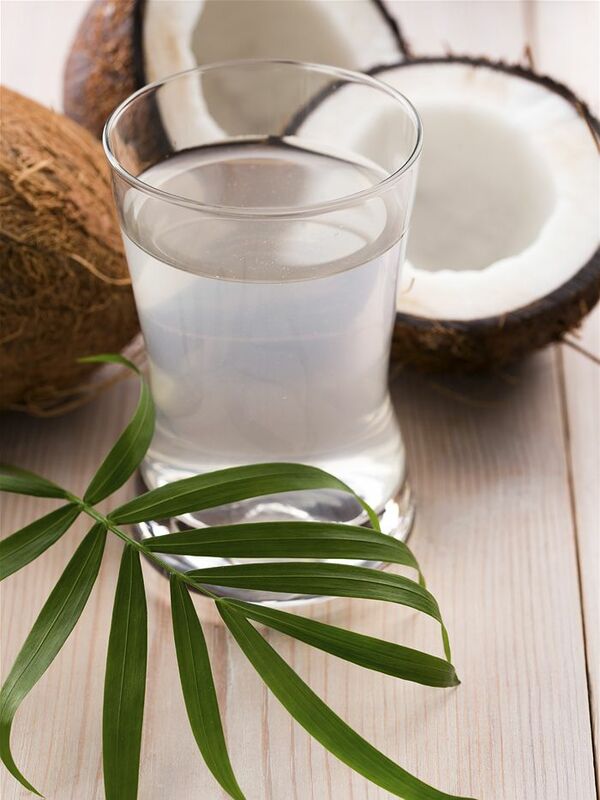 Free of silicone and alcohols, the chemicals that can irritate sensitive skin and hair, coconut oil can be applied as a mask to repair damaged hair – hair that has been bleached, heat damaged or simply needing a little bit of care. Coconut oil has anti-fungal properties. As well as providing shiny, nourished hair, this oil can tackle dandruff, keeping the scalp healthy. Coconut oil is conditioning because it doesn’t just sit on the hair, it penetrates the follicle and is absorbed directly into the hair shaft. Capric acid, Vitamin E and Lauric acid restore the condition of the hair, improving its strength by preventing the loss of protein. Regular applications of coconut oil, from the mid lengths and down, will increase shine and decrease breakage, frizz, knots and split ends. Top tip: for hard working hands, why not treat yourself to a luxury hand moisturiser, while doing the dishes? Simply massage a small amount of coconut oil into the hands, before donning those marigolds and setting about the washing up. The hot water will allow the oil to penetrate the skin and work its magic. Moisturised cuticles are easier to push back, in readiness for your manicure preparation and favourite nail polish application and, at £15 a jar from Holland & Barrett, coconut oil really is an all-purpose bargain! To celebrate this holiday season, we’ve thrown a festive party. Each member of the beauty team brought their favourite crimson polish and we celebrated a shared love of JACAVA London, cream cakes and other sweet treats. Despite being surrounded by nail polish and polish remover all day, we all have to admit we’re a little obsessed with it. Our top reds for this season (in no particular order) are below and feel free to share your comments with us! 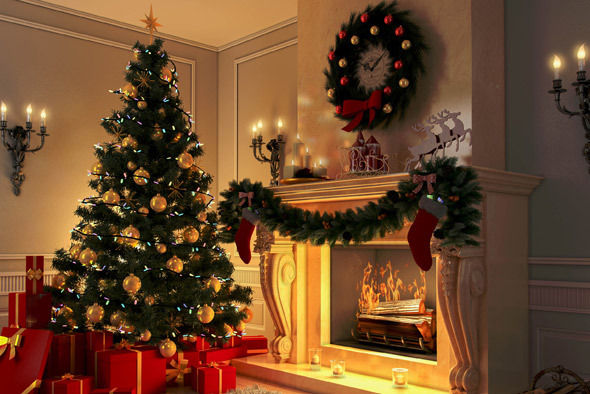 Buying gifts for loved ones is always problematic but, as we get a little older, this becomes more difficult as we’ve pretty much seen everything before and there’s not much out there to impress us sufficient to warrant purchasing it! There are, however, one or two little gems still to discover – it just takes a little time and effort. We’re here to help! Busy is not the word for this lady. Bags packed in readiness to sprint off to the next job, this girl needs luxury stylish living, without the hassle. The Fire TV Stick provides fast streaming of all her favoured media. Connect to HDTV for a world of online entertainment. Movies and TV episodes, voice-searched for ease of selecting Netflix, Amazon videos, BBC iplayer, low-cost movie rentals, live and on-demand sports, music, photos, games and much more. Whether it’s a laptop that needs a secure hold or make up and travel clothes need a small and simple stylish capsule, the leather rucksack is a unique and modern take on the carrier used to transport work, sports and play gear. 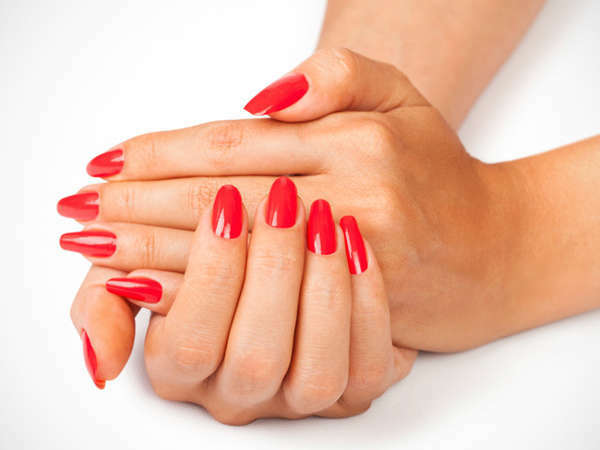 Non-toxic nail polish, a more natural and healthier cosmetic for the nails, is increasingly important to the consumer. JACAVA London are not only 3 free and 5-free nail polish, but also 9-free of the known toxic chemicals that are harmful to health. For the manicure that lasts and lasts, you can’t go far wrong with JACAVA London’s Ridge Filler base coat nail polish. Perfect as a tonic for the nails, containing Argan, Jojoba and Vitamin E oils for nourishing and strengthening, all JACAVA London nail polish are made to a unique 9-free recipe and this base coat provides the perfect platform for all colours and special effect nail polish. Finish with Prestige top coat nail polish, for that perfect salon high shine that dries in moments! Whether it’s red nail polish, purple, nudes, blues, pinks or special effect nail polish or nail care treatments, JACAVA London have something special to pamper the nails this holiday! TOP 10 TIPPLES FOR THE HOLIDAYS! You’ve taken in this year and tackled all its challenges. Win or lose, you’ve earned a treat and now it is time to lighten up and celebrate this year’s experiences, for all have something new to teach us along this journey of life. What better way to live, than follow the philosophy of Epicurianism? The highest good is pleasure, interpreted as freedom from disturbance or pain. Enter: ‘the cocktail’ and, of course, BACARDÍ! This fresh-tasting cocktail was created in the summer of 2008 and features a slice of white peach and two fabulous aperitifs: Cointreau® and Lillet Blanc (a vermouth-style drink flavoured with orange). • Pour all the ingredients into a cocktail shaker. Then add some ice cubes and give it a quick and vigorous shake. Fine strain the mixture into a chilled or frozen glass. Garnish it with the wedge of peach. Originally using red port and cognac, this new twist gives a fresher, lighter flavour by using BACARDÍ Superior rum with white port. The honey, almonds and egg yolk add softness and texture. • Pour all the ingredients into a shaker. Then add some ice cubes and give it a good, hard shake for several minutes. Fine strain the mixture into a chilled or frozen glass. Garnish with grated nutmeg. Created by Marc Bonneton, winner of the first global version of the BACARDÍ Legacy Cocktail Competition in 2011, this cocktail has a powerful aromatic structure and distinctive texture. • Fill a tall glass with ice cubes to chill. Place lime and lemon juice and egg white into a cocktail shaker and dry shake (without any ice) to emulsify. Transfer the mixture to a new cocktail shaker and add the sugar syrup, BACARDÍ Superior rum, Green Chartreuse and fresh cream. Now fill it with ice cubes and give it a good, hard shake until the cocktail shaker is cold. Remove the ice from the serving glass and fine strain the drink into it. Top up with the soda water and garnish with a fresh mint sprig. 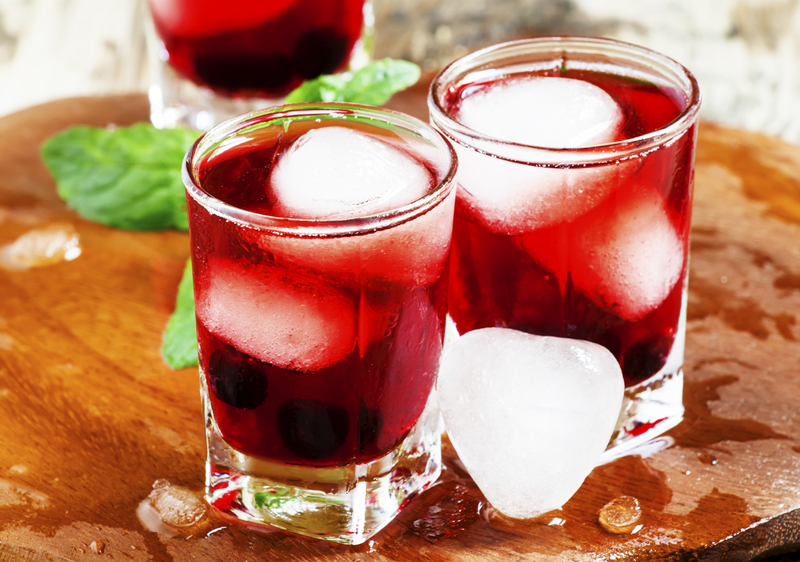 Named simply on the facts: this red drink has shots of rum to sing in the New Year! • Using a muddler (or bar spoon) roughly crush the redcurrants in the base of a cocktail shaker then pour in the other ingredients. Give it all a good, hard shake then fine strain the mixture into a chilled glass. A drink crisp with apple flavouring and carrying the aromatic cocktail of fruit and flowers. Taken from Vintage Cocktails & Forgotten Spirits by Ted Haigh (2004), this is an adapted version of ‘The Secret Cocktail’. • Pour all the ingredients into a cocktail shaker then add some ice cubes. Give it a quick and vigorous shake until the cocktail shaker is cold. Fine strain the mixture into a chilled glass. This recipe comes from Harry’s New York Bar in Paris and is said to be named after a First World War U.S. Army Captain, who used to be chauffer driven to the bar in a motorcycle sidecar. • Pour all the ingredients into a cocktail shaker, add some ice cubes and give it a quick and vigorous shake. Fine strain it into a chilled glass. El Miramar, which means ‘sea view’ in Spanish, is a classic cocktail straight from the 1930’s bar menu at El Floridita in Havana, Cuba. • Pour the BACARDÍ Superior rum, Dubonnet and Amer Picon into a mixing glass and add some ice cubes. Next give it all a good mix and strain it into a chilled glass. Garnish with lemon zest. This classic cocktail is credited to an unnamed US marine captain serving in Santiago de Cuba in 1942. The recipe is taken from Esquire’s 1949 ‘Handbook for Hosts’. • Pour all the ingredients into a cocktail shaker, add some ice cubes and shake briefly and vigorously. Fine strain the mixture into a chilled glass. Garnish with orange zest. Depending on who you believe, the mojito either came from the Spanish word ‘mojar’, which means to wet, or the African word ‘mojo’, which means to cast a spell. Anybody who’s ever tasted one will agree that it’s thirst quenching and spellbinding in equal measures. • Gently press together the limes & sugar. Bruise the mint leaves by clapping them between your palms, rub them on the rim of the glass and drop them in. Next, half fill the glass with crushed ice, add the BACARDÍ Superior rum & stir. Top up with crushed ice, a splash of soda and a sprig of mint. Coffee-based rum cocktails are perfect for warming you up. This recipe was created for the coldest winters. It uses hot coffee, spicy Mayan chocolate, rum and a kick of chilli. • Heat all the ingredients in a pan and stir until they reach boiling point. Then just leave it to cool down for a few minutes before pouring it into a cup or mug. Garnish with coffee beans, chocolate shavings and chilli flakes for a spicy kick. 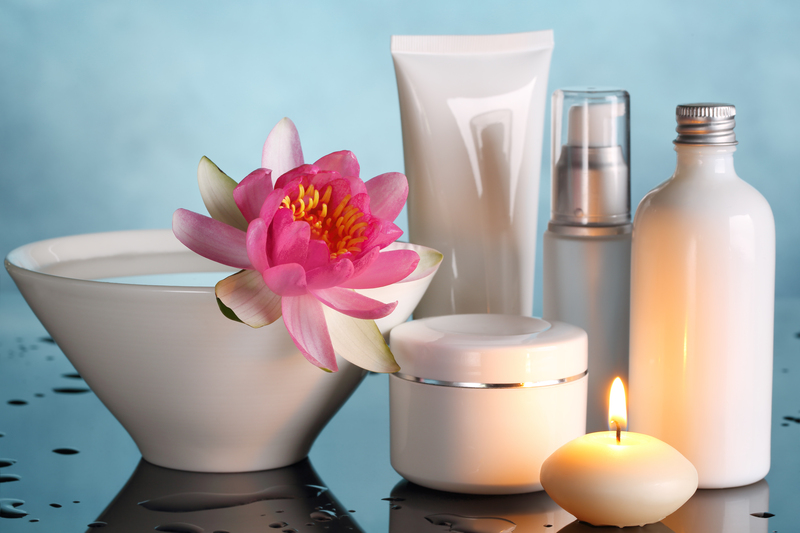 With the onset of winter, the mercury level never stops falling and it is now that you need to take remedial action with your beauty regime. With practical tips and protective care products, JACAVA London reveals time-worn beauty advice that can help you take winter weather in your stride. The changes in temperature can test your epidermis to the maximum. Dry, irritated, tight skin sensations are all perfectly normal, even for oily or combination skin types but, to maintain your skin’s healthy balance during the winter months, it is vital you select the correct nourishing care products. Oils provide outstanding nourishment, moisture and an essential barrier to water based threats to the skin’s condition as the temperature plummets. Shea butter, almond, apricot and coconut oils are the most well recognised protective ingredients to counter the damaging effects of the season. Extra tip: rather than using aggressive soaps for cleansing the skin, choose instead a wash oil enriched in omega 6 to maintain your skin’s natural protective film, the acid mantel. The cold weather restricts the production of sebum, which tends to further weaken dry to normal hair conditions. Brittle locks will require extra fortification on a daily basis and shea enriched conditioners are the perfect tonic for nourishing the hair’s fibres, maintaining soft and shiny manageable hair that is easy to style. Extra tip: ensure that you minimize your use of dry shampoos, lacquers and other sprays that increase static electricity in the hair, selecting an alternative leave-in styling treatment. Extra tip: make sure you use nourishing oil with silk gloves at night to protect and treat sensitive skin and also your bedding from oil stains that are notoriously difficult to remove! Lips are sensitive to cold and wind, causing drying, cracking and chapping. Lip balms and sticks offer a protective solution, by providing a barrier of a thin layer of grease on top of the skin, that stops the skin becoming taught and dry. There are many such moisturisers available, some are tinted or gently scented but, generally, all serve the same moisturising purpose. Extra tip: similar to body scrubs, lip scrubs exfoliate dead and dry layers of skin that are ready to shed. Gently apply to leave your lips beautifully enhanced. It goes without saying that a good night’s sleep can restore the skin and body beyond what most lotions and potions can achieve! Aromatherapy mists, that can be sprayed lightly over your pillow, can offer added calming properties – the perfect remedy for drifting off to dreamland! Extra tip: in addition to a cocktail of essential oils, to enhance the radiance of your skin throughout the winter period, you can also opt for a care product that incorporates essential fatty acids, that nourish the skin while you rest – the perfect tonic for beautiful skin! Don’t forget that a healthy, balanced diet with plenty of fresh water, together with a programme of regular exercise, are essential for optimising your daily skin care regime! We invite you to explore the world of JACAVA London.